Cook the spaghetti for 8 minutes in a large saucepan of salted boiling water, then drain. Fry the bacon in the saucepan and cooked spaghetti, eggs and parmesan cheese. Mix everything together well. Place the whole camembert, still inside its wooden box in the centre of the round cake tin, with the wooden lid removed. 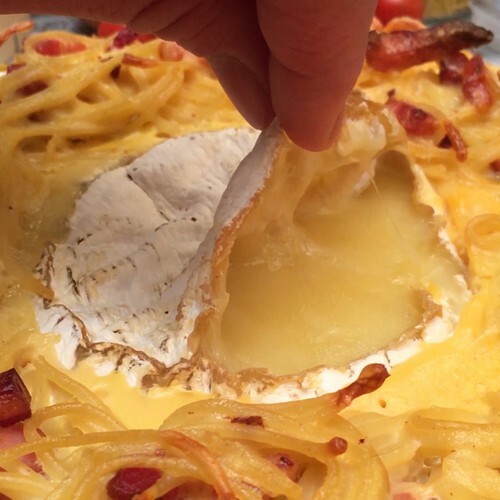 Place the spaghetti mix all around the camembert. Bake for 20 minutes at 210°C. After cooking, remove the lid of the cheese and garnish the crown with a few basil leaves and cherry tomatoes. Eat by dipping chunks of the pasta crown in the cheesy fondue.